A robot controlled by students carries a bean bag on the field of play during Saturday's "Winter Luau" VEX Robotics Qualifier at the Grand Traverse Academy in Traverse City. 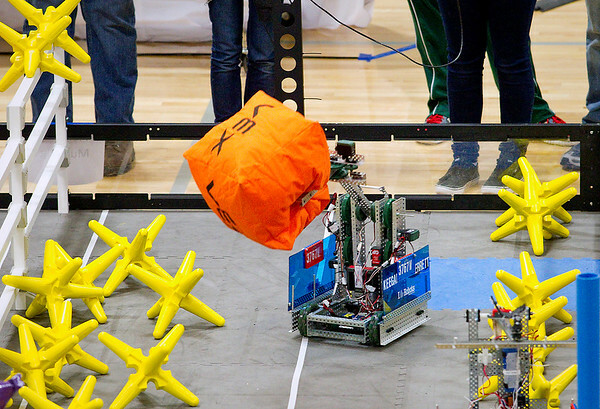 Forty-two teams of junior high and high school students from 16 schools used robots they designed, built and programmed using the VEX Robotics Design System to compete in a "starstruck" challenge involving moving bean bags and star-shaped objects across a barrier to the opposing team's side. Winning teams advance to the West Michigan Qualifying Tournament next week, where they will compete for a trip to the state tournament at Michigan State University February 18 and 19.